The victory snapped a three-game losing streak for the 6-8 Governors, who open Ohio Valley Conference play, 7:00pm, Thursday, at home against Tennessee-Martin. Dalton State, a first-year NAIA program, entered the game having won 14 of 15 contests. Coming off a much-needed eight-day break that saw him go 8-of-32 in his previous three games, the 6-3 Betran connected on 9-of-13 shots, including 6-of-9 from three-point range. 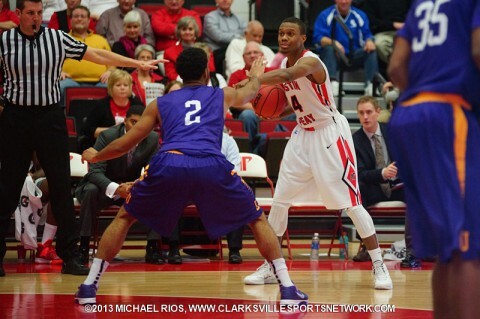 The preseason All-OVC selection scored 16 of his 24 points in the second half, going 4-of-6 from three-point range. He also had six assists. The Governors never trailed in the contest, jumping out to an 11-0 lead, with Betran’s two three pointers giving APSU a quick 6-0 advantage. The Roadrunners never got closer than five points and the Governors took a commanding 41-24 halftime lead on 17 of 24 (70.8 percent) shooting. APSU, which has seen halftime momentum stunted numerous times this season with slow second-half starts, scored the first 10 points of the final 20 minutes and were never threatened. Zavion Williams came off the bench to add 17 points on 7-of-10 shooting while Will Triggs, who also struggled during the week prior to Christmas, added 12 points on 5-of-6 shooting. Damarius Smith, the junior point guard, tied his career best with 12 assists—his third time this season with double-digit dimes. He also had nine points and three steals in 29 minutes. The Governors finished the night 37-of-53 (69.8 percent) from the floor, including 11-of-20 from three-point range. The Govs also held a 44-26 rebound advantage—the third straight game outrebounding the opposition. On the negative side the Governors were just 8-of-16 from the free-throw line while committing 19 turnovers. It was the first time in eight games this season APSU garnered a win committing 18 or more turnovers. Demetrice Jacobs led Dalton State with 20 points, including a quartet of three pointers while Preston Earle added 15. The Roadrunners connected on just 19-of-64 (29.7 percent) from the floor.